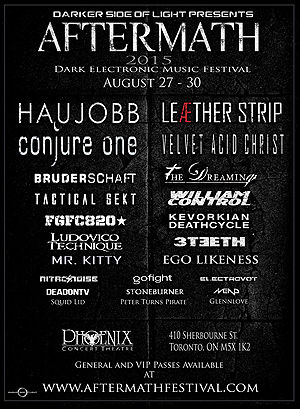 Taking place on August 27-30 in Toronto, Canada, the second edition of the Aftermath music festival will feature as the primary headlining acts Leæther Strip, Haujobb, Conjure One, and Velvet Acid Christ. Presented by Darker Side of Light Productions, the dark electronic music festival will be held at the Phoenix Concert Theatre, with tickets and special VIP passes now available via the Aftermath website. Aftermath is designed to showcase top and upcoming artists in various styles in the dark electronic and alternative scenes, taking up the mantle after the demise of the renowned Kinetik Festival in May of 2014. Other acts to be featured in this year’s event include The Dreaming and William Control, along with electro/rock acts like Kevorkian Death Cycle, 3TEETH, GoFight, and Dead on TV, dark electro acts FGFC820 and Ludovico Technique, as well as Mend and Stoneburner on the IDM/electro end of the spectrum. Several local acts such as Peter Turns Pirate and Squid Lid are also slated to appear.